Paula Waterman cant remember a time she wasnt making art. For the past decade she has been doing just that as a full time artist working in scratchboard, oil painting, and most recently in bronze sculpture. Her subject matter is mostly the animals she sees in the wild and in the company of people. She has a particular interest in birds, and of dog subjects, though landscape and marine subjects are also important to her. This work is sometimes on commission, other times borne simply of a love for the subject. A common thread in all her work in all media probably is the critical importance of light source and light color; in fact she feels that light is the true subject in all her work. In addition to her art work she enjoys gardening and working with her dogs in conformation and obedience competition. 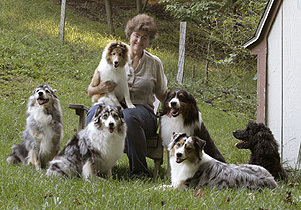 For more detail read Paula's profile from The Australian Shepherd Annual 2007 and her interview from the Australian Shepherd Journal of Jan-Feb 2009. Paula may be reached at: inkwellstudio@comcast.net.